PURE+ Filter Start Gel is available in 1 Litre and 2.5 Litre sizes. The full range of PURE products are available from Evolution Aqua’s stockists. - Shake well before use to ensure the bacteria has not settled. - Unscrew the cap and pour the contents of the bottle directly onto your filter media for best results. - PURE+ Filter Start Gel is not intended to clear green water. It is recommended that an appropriate UV-C should be used to eradicate green water. - PURE+ Filter Start Gel will work at its most efficient in pond temperatures above 12°C. 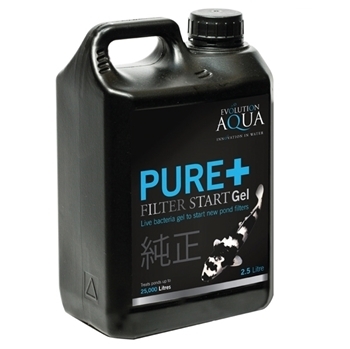 - We always advise the addition of oxygen to your pond via an airpump and diffuser when using PURE+ Filter Start Gel. - Always perform regular water tests using a suitable test kit, especially before adding fish to the pond. - If a UV-C is running, switch it off when dosing and keep switched off for 12 hours after dosing. - Wash hands after use. Keep in a safe place out of the reach of children. If swallowed drink plenty of water.